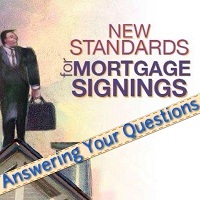 Editor’s Note: In the coming months the NNA will publish commentaries analyzing the individual Guiding Principles of the Certified Signing Specialist™ Code of Conduct, released by the Signing Professionals Workgroup in October 2013. The Standards of Practice in Guiding Principle 1 detailing a Specialist’s qualifications are consistent with this definition of “signing services.” Standards 1.1 through 1.4 touch on qualifications influenced by state and federal laws and regulations. Specialists must undergo a background screening because they must safeguard closing documents containing a borrower’s personal, non-public information (1.1). Specialists must hold all applicable licenses and commissions required to perform signing services (1.2). While this means that all Specialists must hold a Notary commission or appointment, Specialists in certain states must also hold additional licenses, such as a title insurance producer or a law license. Specialists must keep current on all state Notary laws and regulations that affect the performance of notarial acts on documents in the closing package (1.3). Further, since signing services are performed in the context of mortgage finance and real property closings, federal laws and regulations come into play. Specialists also must demonstrate an understanding of all relevant federal laws and regulations governing closings that affect the services they perform (1.4). For example, Specialists should understand the relevancy of the Real Estate Settlement Procedures Act (RESPA) rules prohibiting kickbacks and fee splits among settlement services providers. The Standard of Practice mentions several of the most relevant federal laws Specialists should know. Standards of Practice 1.5 and 1.6 pertain to specific industry credentials and knowledge Specialists must possess. Contracting companies may require Specialists to earn industry certification and demonstrate familiarity with the documents most routinely presented at a signing services appointment. However, as Guiding Principle 4 will clarify, Specialists may not use this knowledge to provide legal, personal or financial advice to a borrower. The ancient Greek philosopher Heraclitus said, “The only constant is change.” Heraclitus was speaking of his doctrine of change in the universe, but he could have been speaking of the modern mortgage finance industry. Faced with new regulations and market forces such as fluctuations in interest rates and the relaxing and restriction of credit, Standard of Practice 1.7 urges Certified Signing Specialists to commit to ongoing learning (1.17). In particular, Specialists must keep informed of “technical matters” — specific industry knowledge — as well as legal requirements and other developments that affect their skills in rendering signing services. Standard 1.8 specifically applies to those Specialists who operate in the so-called attorney-closing states. Where a statute, court precedent or rule of the court may require any non-attorney participating in a real estate closing conference to be under the direct supervision of an attorney, the Standard urges willing compliance with these rules. The qualifications described in Guiding Principle 1 are essential for Certified Signing Specialists because signing services are performed in an industry that is heavily regulated by the state and federal government. For those Specialists looking to distinguish themselves to their current and potential contracting companies, Guiding Principle 1 shows them the way. Bill Anderson is Vice President of Legislative Affairs with the National Notary Association and serves as Secretary of the Signing Professionals Workgroup. When i notorize documents do i need 2forms of I.D. Hello, So we can better answer your question, can you please let us know what state you are commissioned in? To Janet Lee Butler: Hello. We received your query about a print copy of the Signing Specialist Code of Conduct. We're sorry, but we've been told by the SPW the Code is only available in PDF format at this time. Sorry for any inconvenience.